Today’s post is not the one I intended, it has been a busy week so not enough time to complete research for the planned subject, however I was in the area of Lamb’s Conduit Street last Tuesday so made a visit to the pub on the corner of Lamb’s Conduit Street and Great Ormond Street. 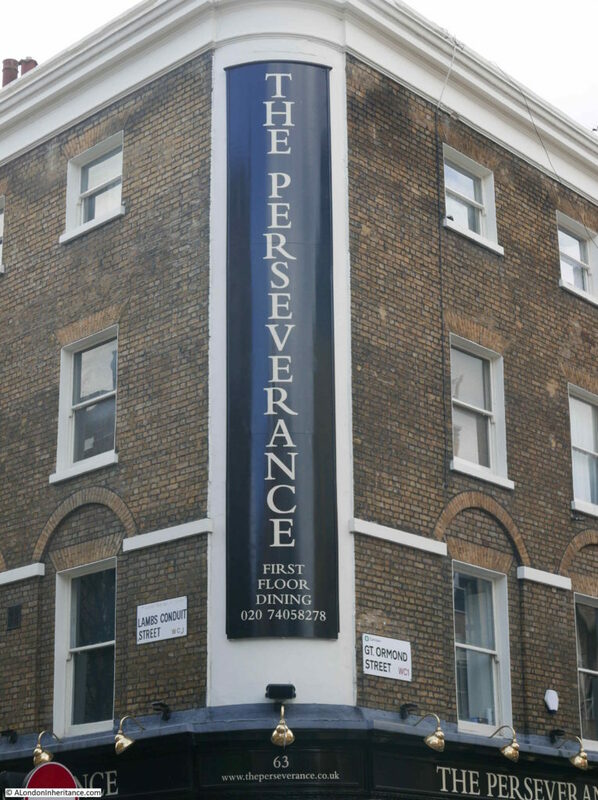 Today, the pub is named The Perseverance, but back in 1985 it was the Sun and had the most brilliant decoration on the rounded corner, so typical of the architecture of 19th century London pubs. This is the same view in March 2019, a change in name and rather more subdued signage on the corner of The Perseverance. Lamb’s Conduit Street has two main, historical, landowners. 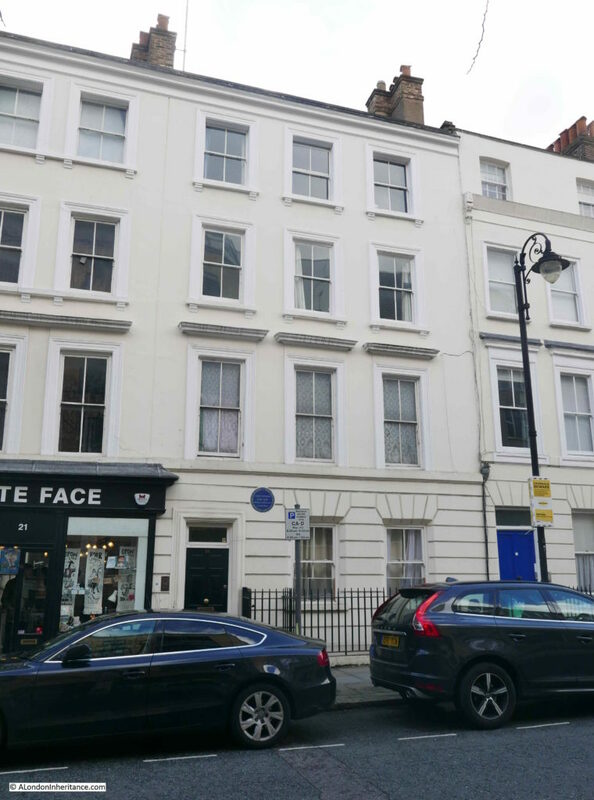 The Bedford Charity (which I wrote about here) owned and developed the southern part of the street, whilst the Rugby Charity owned and developed the northern section of Lamb’s Conduit Street. The Rugby Charity still owns much of the original land, including The Perseverance with the income from the street being used to fund bursaries and scholarships to Rugby School. (There are still a number of Rugby boundary markers in place, so a future project is to walk the boundaries and look for all the remaining plaques that identified the estate). The pub retained the name of the Sun from the early 19th century, to the 1990s when the name changed a couple of times, including being called Finnegans Wake prior to the final name change around 2005 / 2006 to The Perseverance. I have always wondered why pubs change from names that have lasted well over 100 years. I can understand if the pub wants to completely separate from a previous existence, but when the pub continues to serve the same function to the same target market, I would have thought the marketing benefits of retaining a historical name far outweigh the benefits of a new name. There are many other examples of name changes across London. I wrote about the Horn Tavern in Sermon Lane which only relatively recently changed name to The Centre Page. The full view of The Perseverance on the corner of Lamb’s Conduit Street and Great Ormond Street. I did not take a similar view in 1985 – the photo at the top of the post was the last on the strip of negatives so this must have been the end of a roll of film. One of the benefits of digital photography is the almost endless capacity for taking photos. The photo above shows a different style to the buildings immediately joined on to the pub. These buildings, along with the original corner building date from the early 18th century, however the pub was refronted in the early 19th century to the style we see today. The Perseverance retains the feel of a “local” and has a bar area on the ground floor and a dining area on the first floor. It was still rather empty when I stopped for a quick drink as shown in the photo below. 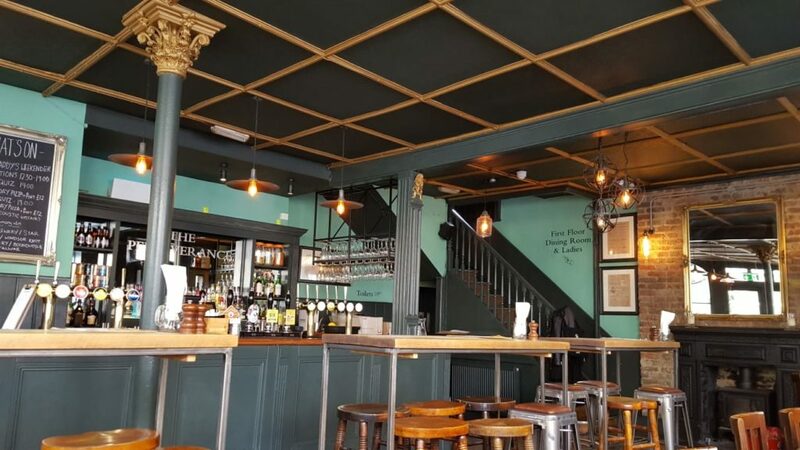 The Grade II listing states that the pub retains an original cast-iron column, which I assume is the column on the left of the bar. Back outside, I had a couple of minutes for a quick look around. 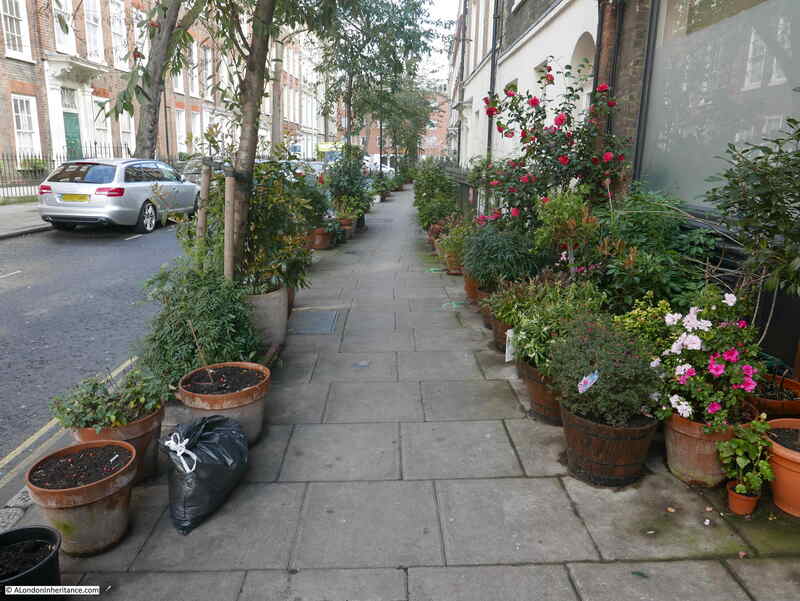 One side of the eastern branch of Great Ormond Street has a fantastic array of potted plants lining the pavement. 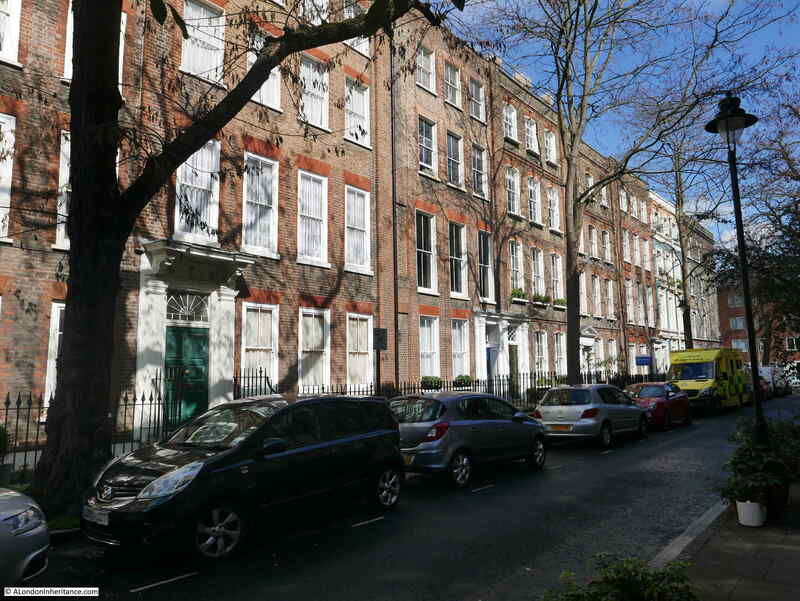 Whilst the opposite side of the street has a terrace of brick built houses from the original development of the land, looking good in the sunshine. 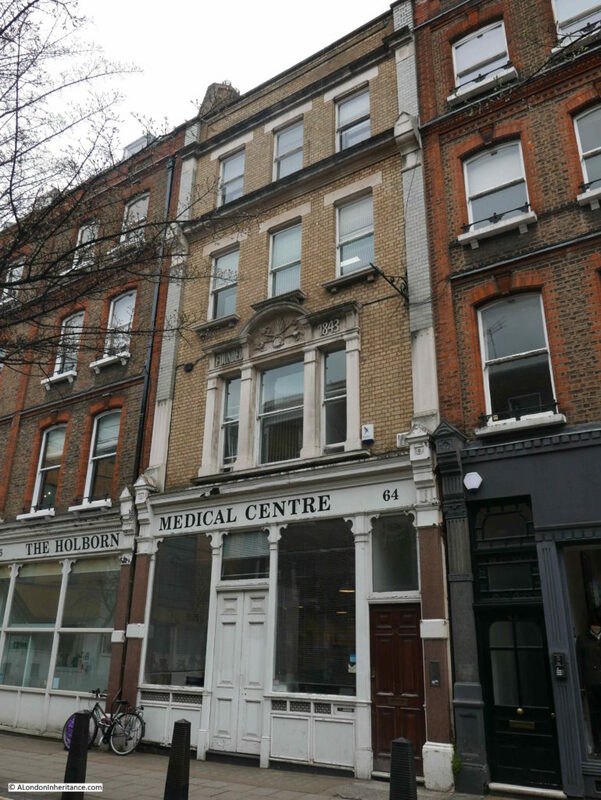 Along the western branch of Great Ormond Street, a short distance along from The Perseverance is this building with a Blue Plaque. The plaque records that “John Howard, 1726 to 1790, Prison Reformer Lived Here”. John Howard was the prison reformer after who the Howard League for Penal Reform was named. Howard was born in Hackney, but spent much of his life in Bedford. He became the High Sheriff of Bedfordshire which came with the responsibility for the county gaol. 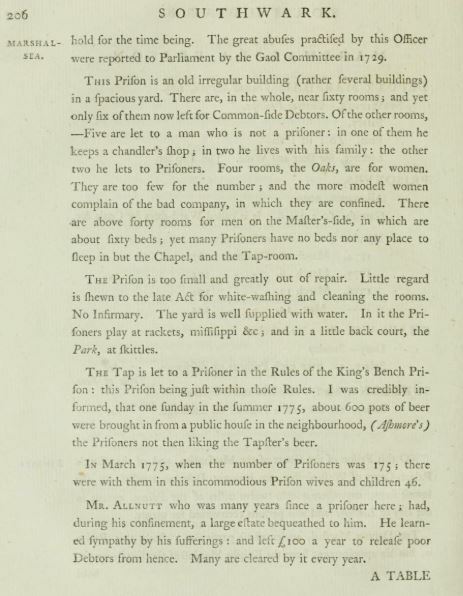 He was horrified by the conditions of the gaol and the way in which it was administered, with control basically being down to the way in which the appointed gaolers wished to manage the prison and make money out of those with the misfortune to be held. 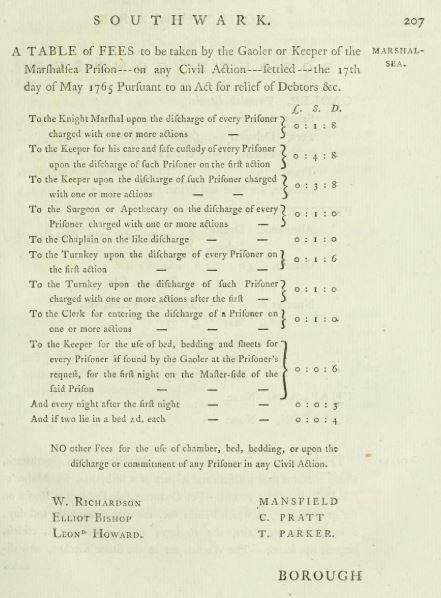 His experience in Bedford resulted in many journeys throughout the country exploring and reporting on the conditions of numerous gaols – all of which suffered from the same problems. 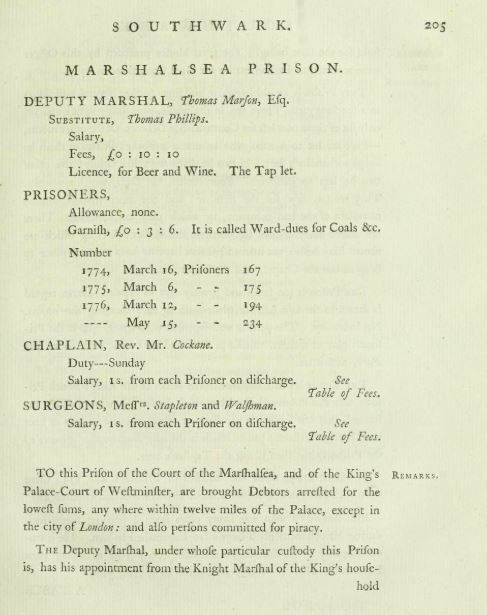 Howard’s book The State of the Prisons In England and Wales is available online at archive.org and provides a fascinating insight into 18th century prisons. I did not have time to explore much further along Great Ormond Street, so I backtracked to The Perseverance to head back down along Lamb’s Conduit Street, which deserves a dedicated blog post, however one building just a short distance from the pub has some interesting decoration above the first floor windows. I could not photograph from directly opposite as the branches of a tree partially obscured the view. Detail of the first floor decoration is shown in the photo below which consists of a date along with a sheaf of wheat, tied with rope, with four hands pulling on the rope. 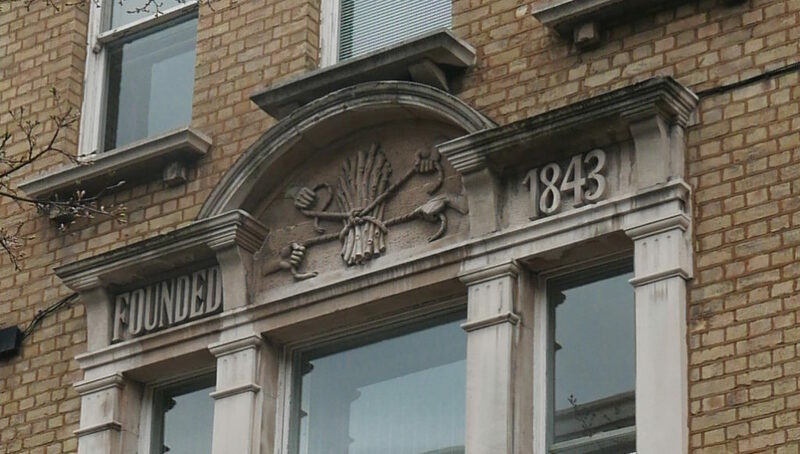 The symbol is of the United Patriots National Benefit Society which was founded in 1843 with offices here in Lamb’s Conduit Street, as well as other offices and branches across London and the rest of the country. The society was one of a number of benefit societies to which members contributed a regular subscription and were then able to call on financial support in times of hardship. The sheaf symbol was used extensively by the society on their buildings, certificates of membership, documentation and badges. “The members of the Caledonian-road branch of this society celebrated their fortieth anniversary by a supper, at the ‘Prince of Brunswick’ Tavern, Barnsbury-road on Thursday evening last. Subsequently, the members having disposed themselves for the evenings entertainment. The Chairman (Mr. W.E. Beer), in a few prefatory remarks condemning the recent disquieting rumours in the press concerning the Navy, proposed the ‘loyal and patriotic toasts’ which were drunk enthusiastically. Mr G. Coel (the branch secretary), in responding to the toast of the evening, said that, up to the end of last year, the members on the books numbered 95. the receipts for 1883 amounted to £116 14s 11d, and the disbursements £114 17s 7d leaving a balance of £1 17s 4d in their favour, he regretted not being able to lay before them a better statement of affairs, but owing to the unfortunate prevalence of sickness during that time, there has been an extra call upon the funds; but it was, at the same time, gratifying to know they have been more than able to meet the demands made, without applying for aid from the mother society. He concluded by thanking them all for their courtesy and kindness accorded to him during his connection with them, extending over seven years (Cheers). The proceedings throughout were enlivened with songs by the company, which separated after cordially approving votes of thanks to the Chairman and the host (Mr. Wilson). I suspect those who had been able to call upon the society during times of sickness were the fortunate ones, with those not able to be members having very little to fall back on. I should not be surprised as I have been walking London for decades, however it is always brilliant how much history can be found within a very short distance from a specific point. 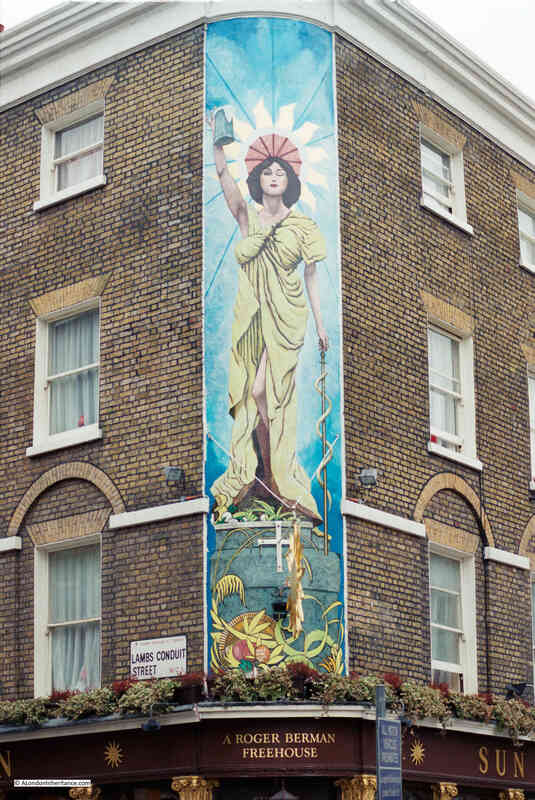 I went to find the pub which had a very colourful decoration in the 1980s and also found one of the key early founders of prison reform and the home of one of London’s benefit’s societies. Digging deeper there is the history of the Rugby Charity which received the original donation of land and has owned, developed and managed much of the local area since, and before that one of the early water supplies to London and the land owner that gave the street its name. Hopefully subjects for future posts. 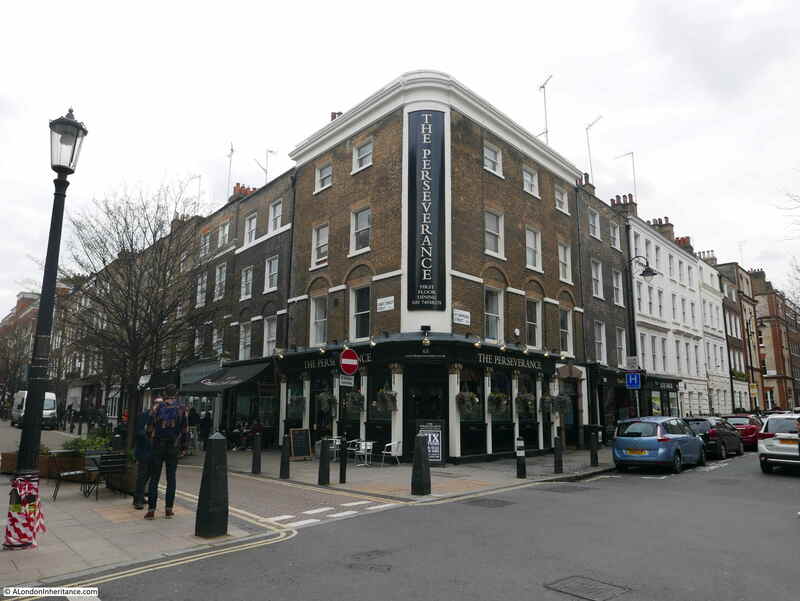 This entry was posted in London Pubs, London Streets and tagged Lamb's Conduit Street, London Pubs, The Perseverance on March 24, 2019 by admin.